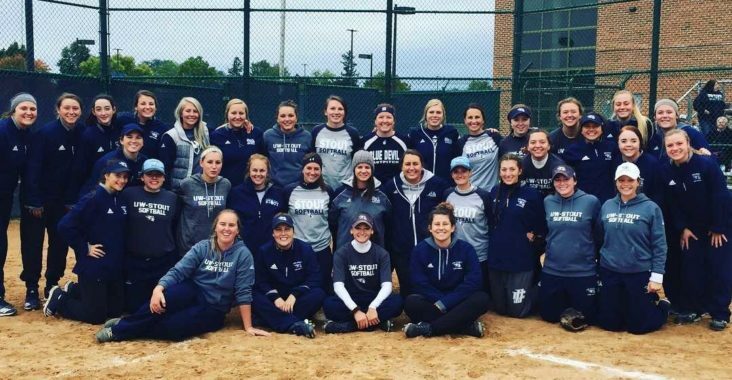 The Stout softball team has had their preparation of fall ball games and an alumni game. The alumni game was slow pitch and none of the girls had ever played slow pitch softball before, they still had a fun time doing it. The Blue Devils have a young team with seven freshmen on their roster this year. Blue Devils catcher and third baseman, Ashley Mossuto, said that she’s never played slow pitch softball in her life, but after she got the hang of it, it was pretty fun to do. She added that it was fun to be able to play with people who have already completed their college careers at Stout. The three captains of the softball team think that their strongest points as a team is that they have a large incoming group that is eager to learn how things are done as a Blue Devil. They also stated that the team works hard and puts in the time that’s needed in order to be a successful college athlete. The team has each other’s back and they make it a point to pick each other up when they’re down. The energy and love for the game that was shown in the alumni and fall games are something that they hope translates into the regular season this year. They think that if they can keep things fun while they continue putting the work in and honing their skills, they will have a successful season. A hurdle they think they’ll face is being able to adjust quickly. It’s one of their key focuses for the season because teams in the conference can see weakness and will attack them. They want to do whatever it takes to turn those weaknesses into strengths for the team. They also want to make sure that the incoming class is ready to step up and understands the level of competition they will be facing. The things the captains want to see throughout the upcoming season is that the team is aggressive and has high energy. They said that their focus is on “failing fast and failing cheap”. What they mean by that is if someone is going to swing and miss, they better be swinging hard. If they make an error in the field, it’s better to do it by playing aggressively. With these three ladies leading their team, the Blue Devils should have a fighting chance in their upcoming season. The team will play their first games in February in the Luther College Tournament.